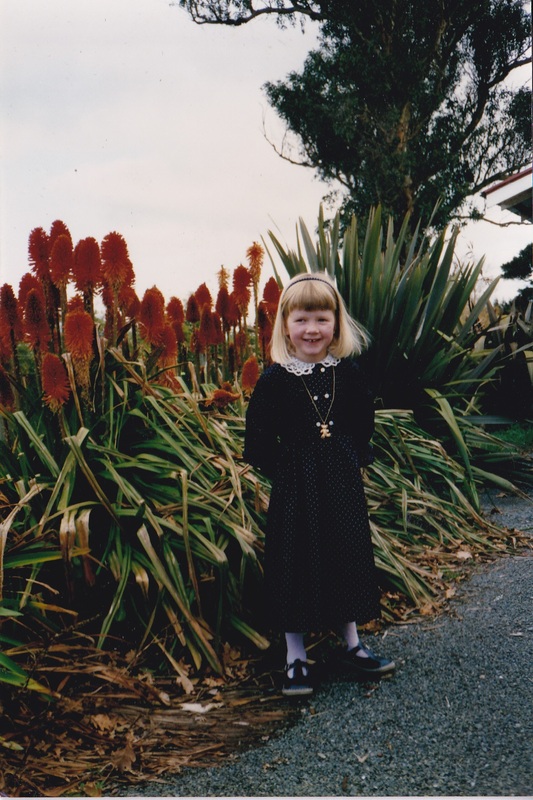 When I was young I used to moan to my parents that I didn’t see the point in walking when you weren’t going anywhere. Since then I have come to appreciate the pleasure in walking, especially when exploring a new city or landscape. But I do still like to be rewarded for my efforts and these are 5 short walks we’ve taken in the north island have done just that. Starting point: At the end of Grange Road at Hahei on the Coromandel Peninsula. Turn left just past the Hahei shops (signposted to Cathedral Cove) or take the park and ride from the town. Wonders: Stunning views, cows, bays and a secluded beach with clear blue waters, split in half by a rock arch. The day we visited the waves were strong down at the Cove but was great for swimming and sunbathing. Gorgeous place to spend an afternoon. We got caught in a tropical downpour on the walk back up. Happy New Year! Hope you had a fantastic time wherever you welcomed in 2014. After spending Christmas day in some of the North Island’s rural farmland, we travelled across to Rotorua on Boxing Day. We had been planning borrow a friend’s car but, due to mechanical problems, we found ourselves exploring the area’s thermal wonders and tourist attractions on foot. Man, we did some walking! Rotorua is in the Bay of Plenty and built upon some of the country’s most volcanic and volatile ground, the lake itself being a crater. 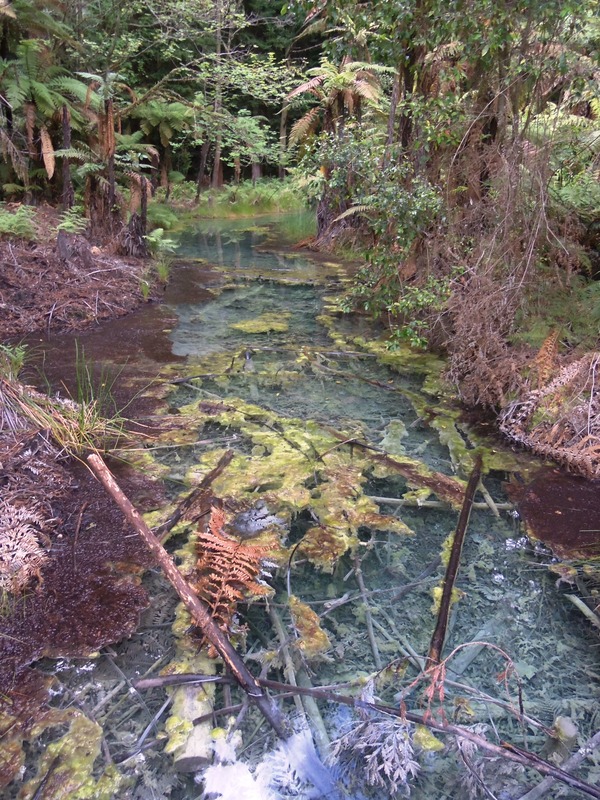 This is what gives the area its tourism pull; bubbling mud, geothemic pools and a distinctive sulfuric smell (think rotten eggs). We stayed in a hostel on ‘motel mile’, which runs into Rotorua’s centre and down to the lakefront. It is classed as a city (53,000 population) but feels more like a small town and we were pretty underwhelmed by the central streets and their succession of tired souvenir shops. Probably didn’t help that we arrived on a public holiday when many of the restaurants and shops were closed. 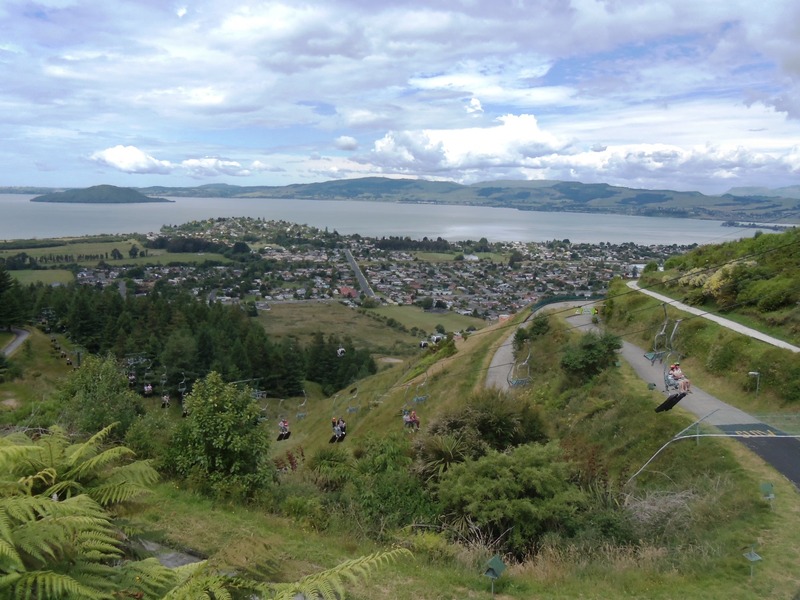 After a stop at the i-Site and being told how few of the attractions were walkable, we strode out for 4.5km to the Skyline and Luge. The long, roadside stretch had a feeling of Americana with car dealerships, liquor stores and even a Wendy’s. We really enjoyed luging (no snow!) down the hillside and the gondola offered fantastic views of the area and lake. Open 9am till late / Gondola $25 and 1 luge $10. 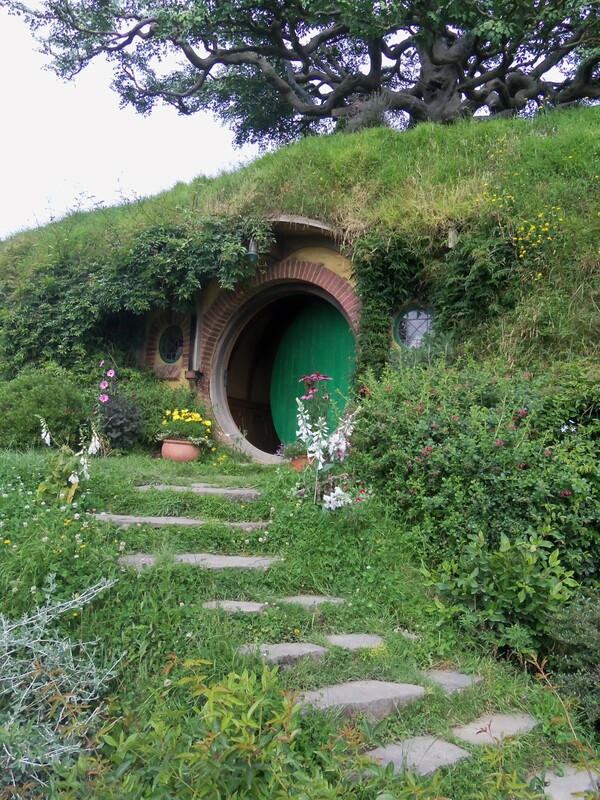 Channeling his love of Tolkein and Middle Earth, Rob caught a tour from Rotorua i-Site out to the Hobbiton film set (Lord of the Rings and The Hobbit films). A really fun and informative guide took his group around the village, which is situated on a huge sheep and cattle farm near Matamata. The tour’s best bits were seeing Bag End and the Green Dragon pub which serves a delicious apple cider, sadly it was a little early in the morning to try the other beers on offer. Would recommend trying to get on the first tour of the day so there aren’t other groups ahead of you. Great fun if you enjoyed the books and/or the films. Translated in Maori as ‘sacred waters’, this was the stop on our trip to really see the geothermal/volcanic activity in action. Collapsed craters, silica terraces, steaming lakes, Lady Knox geyser shooting water high into the air, acidic streams, bubbling mud and a luminous green lake all together made us feel like we were on another planet. A stunning place. We went with Grumpy’s Tours and had some trouble with being forgotten on the scheduled pickup but once we were on the tour our guide was great and full of interesting facts about the area. Another long walk to the vast and beautiful Redwoods Forest. 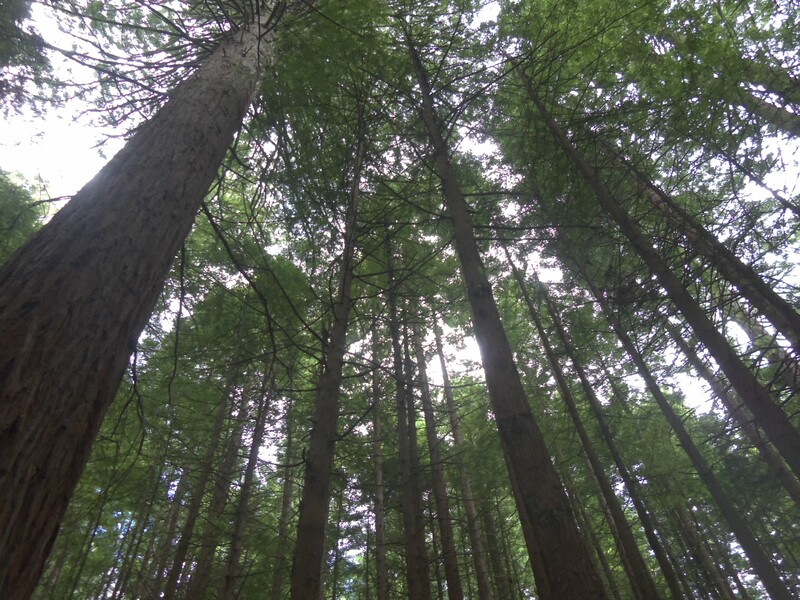 Home to native trees and wildlife, endless walks and mountain biking tracks. A lovely place to go for a bit of peace away from the touristy city. The newest attraction to Rotorua and an exhilarating afternoon. 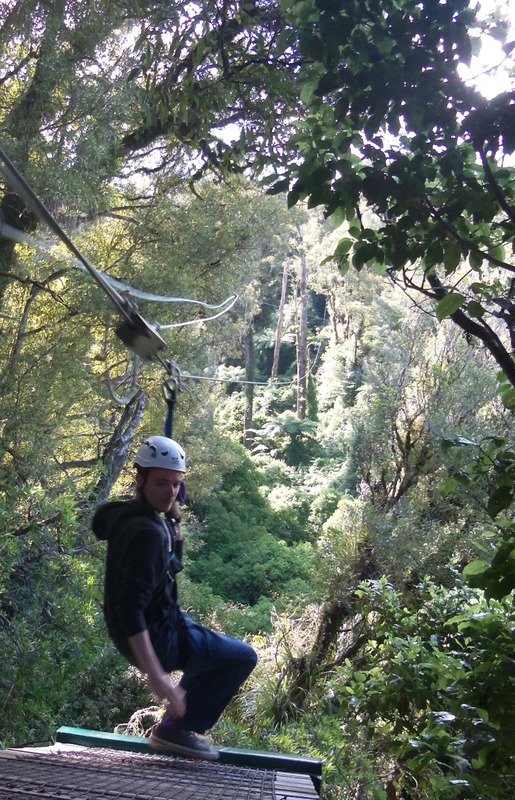 We glided (not always so gracefully) across 10 ziplines, 22m high in the tree tops. We felt very safe in the hands of our kiwi guides and learned about the conservation work the company is undertaking to help support native birds to the forest. Rolling 250m down a track on the side of a hill in a big rubber ball with a few buckets of warm water. Ogo is made by the inventors of the Zorb but this one is cheaper and closer to town. It is still quite expensive for a pretty short ride but it was loads of fun. Remember to take clothes to get wet in, you end up totally soaked through. We chose to go down the sidewinder track in a ball together. On the site of a medicinal bath house, which treated patients until the mid 1960s. The museum houses exhibits on Maori history, national troops and the country’s volcanoes and earthquakes. These didn’t quite match the offer of Auckland War Memorial Museum, but the cinema simulation and wearing a hard-hat to wander around the dusty pipes of the mudhouse basement were the main attractions for us. It also provided some historical context to the ‘Aix’ massage treatment I had in the nearby Polynesian spa, which opened to cope with the demand from the public to experience the wonders of bathing. Good rainy day activity. 9am – 6pm, with free hourly guided tours. Adults $20. 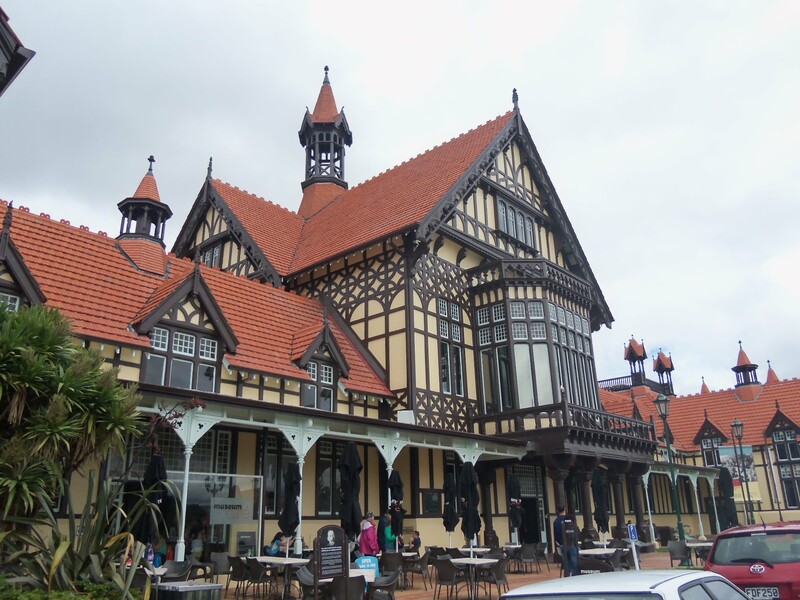 Rotorua is also well-known for its living Maori villages. We have heard how good these are, and while we are keen to find out more about Maori history, we didn’t feel comfortable about their culture being reduced down to a tourism experience. Looking back on our trip, we didn’t fall in love with the city’s centre or feel like we could spend an afternoon wandering around it streets, but we felt spoilt for choice in terms of activities to do nearby. 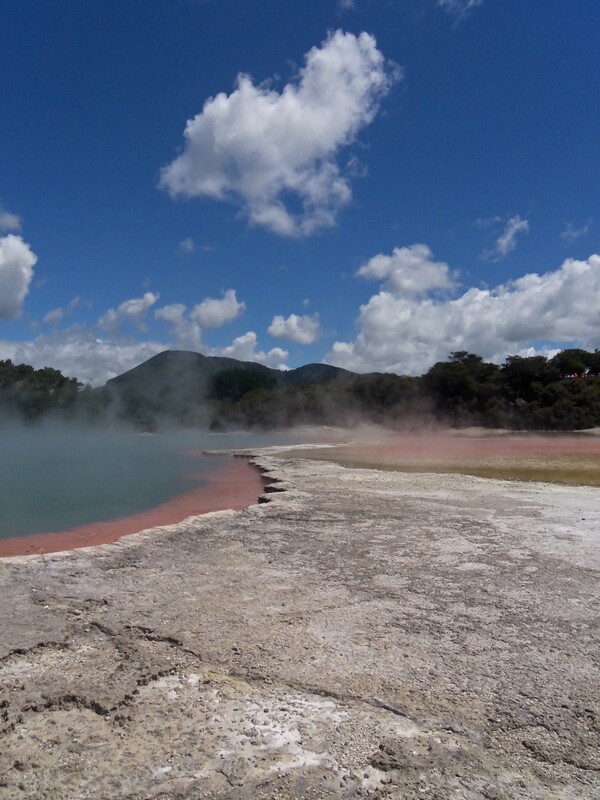 2-3 days is probably ample time to spend in Rotorua and take a car if you can! 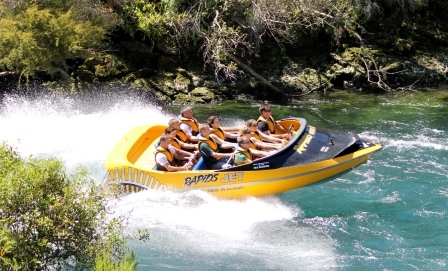 Last weekend we jumped in a jet boat for an exhilarating ride on the Aratiatia rapids. We were staying with friends near Whatamauru and treated our weary bodies to a watery wake up on Sunday afternoon. 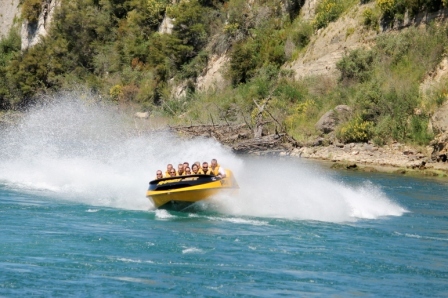 Our driver took us on a 35 minute ride down the Waikato river, near Lake Taupo and just downstream for the Aratiatia dam. The rapids are flooded by the dam 4 times a day to recreate how the river used to flow before the dam was built. Firstly we had a close up look at one of the uses of the dam’s water surge: the Aratiatia power station and the main source of hydro-electricity in the North Island. Unsurprisingly, the river has been the setting for several films, including Yogi Bear, Without a Paddle, Mr Pip and The Hobbit. After some wave riding and spins, we floated into the shallows to spot Taupo trout. The boat’s speed was invigorating and I couldn’t help grinning the whole time. The ride turned out to be a great hangover cure and the sun dried us off pretty quickly. We’re keen up in the front row! 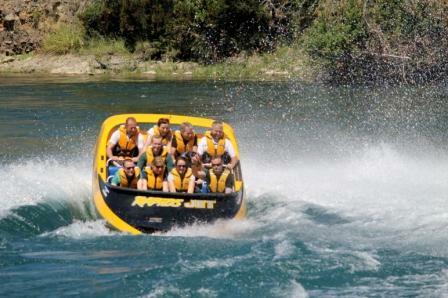 Located 15 km (15 min drive) north of Taupo with a shuttle available from Taupo.